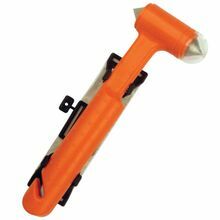 The Emergency Rescue Hammer comes in bright reddish-orange to ensure you can find it when you need it. It has two pointed tips so you can swing it from any position to break the window or windshield of the car and make your escape. Also built-in to the handle of the hammer is a safety blade, perfect for cutting a seatbelt. The hammer comes with a holder you can fix to any surface either with the included screws or sticky tape. Don't be without this necessary rescue tool, have one in each car, camper, motor home. Makes a great gift.